On the train to Santa Rosa a little over a century ago, you might have exchanged a nod of recognition without knowing who he was. His was a sort-of-familiar face, someone who could be spotted going or coming several times a year, maybe with his wife and daughter or the two young men who were his sons. But once the train arrived, the portly middle-aged man vanished; he couldn't be found at any of the hotels or bending his elbow at any of Santa Rosa's many saloons. He wasn't at card parties or lodge hall dances. He didn't hobnob at all. Probably not a soul on the trains knew they were looking at Thomas Kearns, the millionaire owner of Los Guilicos. Kearns had one of those incredible 19th century rags-to-riches life stories. In 1883, legend has it, he was farmhand pitching hay; six years later he was one of the owners of the Silver King mine, then the most valuable silver mine in the world. 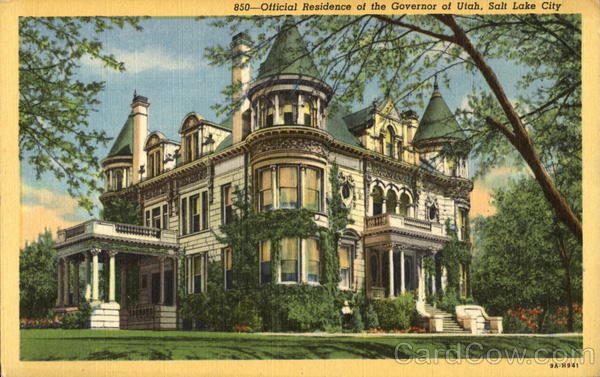 With his boundless wealth he built an extravagant Salt Lake City home for his family in 1902, which today is the Utah Governor's Mansion (see postcard at right). Three years later he bought the William Hood House and ranch at Los Guilicos. From mentions in the Press Democrat column on arrivals and departures we know that Kearns and his family spent quite a bit of time here, including the complete summer of 1905, which was before renovations started. There were some years where he or his wife could be found at Los Guilicos nearly half of the time, particularly after the remodeling ended in 1908. It was a true second home and not a vacation getaway; the Kearns' should properly be considered locals - their sons even went to college at Santa Clara rather than in Utah or out east. In "Sketches of the Inter-Mountain States," the 1909 history of Utah and neighboring states, his equal residence in California was acknowledged: "Senator Kearns and his family reside in a magnificent home on East Brigham Street, in Salt Lake City, and at one of the finest ranches in California, near Santa Rosa." Yet curiously, this side of his life is rarely, if ever, mentioned in modern profiles, including his book-length biography. Because of that, some of the most interesting questions about Kearns are unanswered and even unasked: Why did he want a house in Sonoma County, where the family apparently had no friends, family, political connections or business interests? And once he owned Hood House, why did he spend so much time here, so far from the life he had struggled to make for himself and everyone he knew? The answer to his Rosebud secret probably lies in the late winter of 1905. Given his wealth and wealth of connections, it would be surprising if Thomas Kearns had not become a politician. He knew three presidents and hosted a dinner for President Teddy Roosevelt at his Salt Lake City mansion. Consider, for ex, the nexus of money and power revealed in just this one deal: Senator William A. Clark of Montana sought help from Kearns in extending his railway line from Los Angeles to Salt Lake City. (Clark was a man so remarkably corrupt that Mark Twain wrote, "He is as rotten a human being as can be found anywhere under the flag," and also looked just like Conan O'Brien wearing a cheap fake beard, which is conclusive proof that he was a person of low character.) Also involved in the railroad deal was Richard C. Kerens, who was on the National Republican Committee and a personal friend of Kerns. Our very first glimpse of Kerns in Sonoma County comes from a 1906 PD article about Kerns showing off his new place to his pal (misspelled as "Kernes" in the transcription below). Thomas Kearns was a U.S. Senator from Utah between 1901 and 1905, filling out the four years remaining on an unexpired term. Many in the LDS church would have liked the seat go to a member of their faith, but just two years earlier a Mormon polygamist had been elected to the House, creating such national uproar that he was expelled immediately after being admitted to Congress. Kearns was politically well-connected with the Republican leadership, and that he was an ardent Roman Catholic "gentile" didn't hurt a bit. The Mormon hierarchy endorsed Kearns, amid allegations there was a quid pro quo deal for Kearns to buy the Salt Lake Tribune and defang its anti-Mormon slant. His alliance with the church began crumbling within a year as political fortunes rose for Reed Smoot, who had been talked out of running against Kearns in 1901. The next year Smoot was elected the junior Senator from Utah, despite opposition from Senator Kearns and the rest of the Republican establishment, including President Teddy Roosevelt. Republicans feared Smoot would face a Congressional inquisition similar to the hearings over the polygamist. And indeed, once he was seated, the Senate opened investigations into whether he was a secret polygamist or if his extremely high position in church hierarchy placed him in conflict with his oath of office. With the end of his term approaching in 1904, Kearns was denied another LDS church endorsement. Supporters of Kearns retaliated by forming the anti-Mormon American Party, and criticism of the church resumed in his Salt Lake Tribune. The political career of Thomas Kearns ended when Senator Reed Smoot convinced the Utah state legislature to replace Kearns with a Mormon (Senators were not yet elected by popular vote). Kearns said farewell to the Senate in his "Conditions in Utah" speech, where he bitterly denounced the power of the Mormon church. He charged the LDS "monarchy" lied repeatedly to the U.S. in order to gain statehood in 1896, falsely claiming polygamy was banned and the church did not meddle in politics. But Kearns had no fervent political loyalties. Earlier he made large contributions to both parties, first to the Democrats in 1896 because he supported candidate William Jennings Bryan's demand for currency using silver, and then to the Republicans in 1900 when it was clear that the McKinley-Roosevelt ticket would win the White House. He was fond of going to conventions and speechified on behalf of his friend Teddy Roosevelt at every opportunity. That he served in the Senate at all was a bit of a fluke, as discussed in the sidebar. Kearns' stint in the Senate was uneventful, perhaps because it was so short. No legislation bears his name, and what bills he introduced were pork barrel giveaways for special interests in Utah. He asked for 20 acres be given to his wife's aunt for a home for old miners; he wanted to open up part of an Indian reservation for mining. An old military fort received an upgrade. It was all apparently small matters like that. A researcher would need to drill down to the voting records to find what issues he supported or opposed and if not for the passion exhibited in his infamous farewell speech, one might think he didn't really want the job at all. When the Mormons declined to support his candidacy for reelection, Kearns felt used and betrayed. He had valid reasons; he had brokered a relationship between the Republican party and LDS church long sought by Mormon leaders (a good paper on this topic can be read here) and found patronage jobs in Washington for Mormons. He had vowed to oppose any proposed constitutional amendment against polygamy. He had purchased the Salt Lake Tribune and quashed its LDS criticism (although there's no proof church leaders demanded he do so). And probably most bitterly, he had been used as a stalking horse to ease the way for Utah to have two Mormon senators. Kearns' "Et tu, Brute" moment came when Utah's junior senator, Reed Smoot, personally led the Utah politicking to oust Kearns and replace him with his friend and fellow Mormon, George Sutherland. Smoot drove the knife in further with his remarks about Kearns' farewell speech, adding an ethnic slur: "It certainly was a spectacle to see Kearns deliver his speech yesterday. It made the people from Utah ashamed that there was such a person as Tom Kearns claiming to be a citizen of Utah. His speech was written in English and delivered in Irish." Thus Hood House might also be nicknamed, "Kearns' Redoubt." His four-year ascent into politics had ended with an abrupt and humiliating crash, through no fault of his own. He apparently purchased the Los Guilicos estate shortly thereafter. In the summer that followed he probably saw the roomy home with bucolic views of Sonoma Valley as a fine place to lick wounds and drift in melancholy. Years later Santa Rosa newspapers frequently mentioned he was entertaining friends from Utah, and you can bet their small talk tread lightly around some topics of political gossip, particularly the sore point of his own fall from greatness as the Catholic who lost his Mormon blessings. In hindsight, we can see everyone lost when Kearns was forced out of the Senate, including the Latter-Day Saints church. The Senate allowed Reed Smoot to be seated, but opened hearings on his fitness to stay. The Smoot hearings dragged on for three years, and became a trial of the LDS church itself. Women's groups nationally lined up against Smoot and Mormonism in an anti-polygamy crusade that smothered Washington in petitions and letters. But over those long three years, anti-Mormon sentiments weakened. President Roosevelt originally commented that Smoot was not fit for office, but by end of 1906 he said the women crusaders were guilty of "persecution" and "hysterical sensationalism." The New York Times also flipped, denouncing in 1907 opposition to Smoot as "mindless and bigoted". At the end of it all, a majority of Senators did vote to boot Smoot, but he was admitted because a two-thirds vote was required. The big loser in this draw were the women's groups, having lost some popular sympathy as well as momentum in their great fight for suffrage. The LDS church lost because Kearns might have been able to shorten the hearings - or lobby other Senators to drop some of the most damaging lines of inquiry - if he had remained as the senior Senator. In Utah, the Kearns affair boosted opponents of the church and the American Party dominated Salt Lake City politics through the rest of the decade. The drama also had far-reaching impacts on American history. Senator Smoot was co-author of the infamous Smoot-Hawley Tariff, which is considered one of the major causes of economic hardship during the early years of the Great Depression. Kearns' replacement in the Senate, George Sutherland, was eventually appointed to the Supreme Court, where he became the leader of the "Four Horsemen," a reactionary bloc that sought to overturn FDR's New Deal programs for recovery. The four Justices were frequently hung in effigy at political rallies. Kearns didn't live to see what would become of Smoot and Sutherland two decades later; he died in 1918, shortly after he sold Hood House. I would like to think his ghost is still rattling chains in those empty rooms of the place he must have thought of as a sanctum. I would like to think his ghost is having a good chuckle over the two men who destroyed his political life becoming two of the most hated politicians in America. Former United States Senator and Mrs. Thomas Kearns of Salt Lake City, accompanied by Mr. and Mrs. R. C. Kernes [sic], Miss Kernes and Miss Baney of St. Louis, and Miss Bettinger of St. Joseph, Mo., are at the St. Rose. The party came up to the Senator's Los Guillicos [sic] ranch yesterday morning and were met at Kenwood by automobiles from Santa Rosa. After a visit to the ranch the party were taken for a ride through the valley and then for a visit to the grounds of Luther Burbank. Mr. Kernes is a prominent railroad man from St. Louis and the fact that he is visiting through the Sonoma Valley has given rise to the suspicion that he may be inspecting the line of the proposed electric railroad from Sonoma to Santa Rosa, which is believed to be part of a through line to the bay or to connect with the other lines planned to cross the lower end of the county en route from San Francisco to Lake county with a view of investing in the enterprise. It is known that he was given a good opportunity to see all the advantages of the valley while taking the automobile ride. F. S. Smith of 1209 Ripley street has just completed at his place and has ready for delivery a handsome natural oak dining room set for Senator and Mrs. Thomas Kearns of Kenwood. 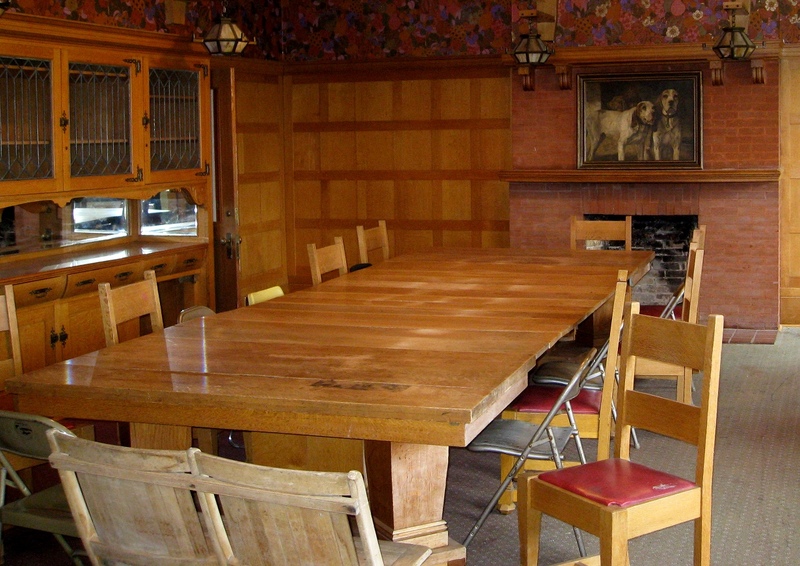 The dining table is a massive affair weighing 850 pounds, and is six feet square closed. It can be extended to fourteen feet and is one of the most attractive pieces of furniture ever seen in this city. The buffet, serving table, pedestal and dozen chairs are all made to match. The whole set is handwork by Mr. Smith, and were worked up from designs he drew and submitted to Senator and Mrs. Kearns for approval prior to receiving the order. Former United States Senator and Mrs. Thomas Kearns and family and Miss Bess Faddies have returned to their beautiful country home in the Los Guilicos Valley, from Salt Lake City. They went to Salt Lake recently to be present at the dedication of the new Roman Catholic Cathedral there, one of the most costly and handsomest edifices in the west. At their Salt Lake City residence Senator and Mrs. Kearns had the honor of entertaining His Eminence Cardinal Gibbons, who dedicated the cathedral. They had other distinguished guests, including several of the Bishops and other dignitaries of the church. The many local friends of Senator and Mrs. Thomas Kearns will be pleased to know that they expect to spend the Christmas holidays at their very hospitable home "Kearns Ranch" in Sonoma Valley. They will have a large house party of relatives and friends to enjoy the holidays with them. Mrs. Kearns is expected back from New York about the first of December. The two sons of Senator and Mrs. Thomas Kearns will be here from Santa Clara College to spend the Christmas holidays. Senator Kearns will also join the family for celebration of the holidays at the beautiful Kearns residence at Los Guilocos [sic]. At the picturesque Kearns ranch last night there was a brilliant party at which Senator and Mrs. Thos. Kearns were "at home" to many invited guests. The function was arranged in honor of Miss Clara Driscoll who is visiting the Kearns ranch from her home in Salt Lake City. Many guests from this city drove out to Los Guillicos to enjoy the delightful hospitality and participate in the many pleasures of the evening. Mrs. Kearns, as usual, entertained with the cordial and lavish hospitality for which the home is known far and wide. After the hour devoted to the reception during which all the guests had the pleasure of a formal introduction to Miss Driscoll, dancing was enjoyed in the ball room adjoining the mansion. Later an elaborate supper was served. Mrs. Thomas Kearns expects to leave for Salt Lake City about January 15. The Hearns have a magnificent home there and it is like 'Kearns Ranch' near this city, one of the most hospitable of homes. I overheard Mrs. Kearns telling some friends at the Overton party the other evening how much she and Senator Kearns enjoyed their picturesque county mansion in the Los Guilocos [sic] Valley. Thanks to them many Santa Rosa friends have been afforded much pleasure there, too. Former United States Senator Thomas Kearns has arrived here from Salt Lake City, accompanied by Mrs. Kearns, and is spending a few days at his beautiful country home near this city, Kearns Ranch. Since his last visit here Senator Kearns has made several trips East and has been a very busy man. He is delighted with the appearance of things in Sonoma county at the present time. The week of festivity will be auspiciously ushered in by the reception and high tea Sunday afternoon, at which Mrs. Thomas Kearns will entertain in honor of her sister, Mrs. Gallivan, a charming woman of Salt Lake City, who is here to spend the summer. The hours of the function are from four to seven o'clock and many Santa Rosans are included in the invitation list. They will drive to Kearns Ranch or will take the afternoon train from this city. Of course, it goes without saying that Mrs. Kearns' attractive hospitality will be delightfully exerted. The hostess and her guests were wishing Saturday when the threatening raindrops fell that sunshine would abound for the happy hours to be spent at Kearns Ranch. KEARNS RANCH, the delightful country seat of Senator and Mrs. Thomas Kearns near this city, was the scene last Sunday afternoon of a reception given by Mrs. Kearns in honor of her sister, Mrs. Gallivan, a charming woman from Salt Lake City. With its commodious rooms, richly furnished and arranged in luxury and comfort, the Kearns home is an ideal one for entertaining. It was specially so on this occasion as the affair partook of an outdoor party on the beautiful grounds where Nature has aided the landscape gardner in a distribution of majestic oaks, shrubbery and flowers in all their glory. After meeting Mrs. Gallivan, the motif for the function, and the hostess Mrs. Kearns, who received their guests on the veranda beneath a clustering rose vine, which was a riotous mass of sweet-scented rosebuds, the guests wandered at will among the flowerbeds and amid a wilderness of roses--at Kearns Ranch during the blossoming time it is a continuous rose carnival--rested on the rustic benches or in the hammocks or swing seats in the shade of the overhanging branches of trees. It was an afternoon of sunshine and everything looked its best. Music, sweet and an allurement to pleasure, mingled very effectively with the enjoyment of the rambles through the grounds. It was furnished by a large orchestra stationed in a leafy nook on the lawn. During the hours of the reception and during the serving of high tea the orchestra played, Miss McDermott presided over the punch-bowl, serving the guests with delicious refreshment. At tea the guests assembled in the large reception rooms, where tasteful bouquets of roses and other blooms gave a delightful finish to the pretty scene. In serving Miss Bess Faddis, Miss Clara Einhorn, Miss Geraldine Grace, Miss Wickson, Miss Elizabeth McDermott and Miss Helen Kearns were among those assisting. Mrs. Kearns and Miss Wickson ex- [missing line of type] people from Santa Rosa, Kenwood, San Francisco and other places. Many of those invited drove down to the Kearns home in automobiles and others came by train and in vehicles. Mrs. Kearns was a much complimented hostess. She could not have entertained more effectively. Mr. Kearns and Miss Wickson expect to leave shortly for Salt Lake City where they will spend some time. They will return before the summer is over, however, to pass several months here. Mrs. Thomas Kearns returned to her beautiful country home, Kearns Ranch, near this city, on Saturday night after an extended absence in Salt Lake City as well as on a trip to the East. Mrs. Kearns expects to spend a considerable portion of the summer in Sonoma county. She went to Santa Clara College on Monday to attend the commencement. The Kearns boys are students at Santa Clara. Mrs. Kearns' many friends are glad to welcome her back. The week opened very auspiciously with the dinner party at Kearns Ranch...The scene in the spacious dining room of the Kearns mansion was fascinating in the extreme when the guests entered to the strains of music from an orchestra. They stepped into a lovely bower of flowers and light with the immense round table artistically set with its silver and glass and its clusters of daintily shaded candelabra, occupying the center. The rich old oak ceiling and the oak-panelled sides of the room were set off with bright adornments of flowers and more candelabra. It would be hard to picture a more alluring effect from a decorative standpoint or a greater incentive to appetite as one course followed another during the two hours the guests sat at the table enjoying the delightful menu and the intermingling chit chat, story and orchestral music. Former United States Senator Thomas Kearns of Salt Lake City is here for a visit of several weeks at his beautiful country home "Kearns Ranch" near Kenwood. Senator Kearns is a man of much prominence financially as well as politically and is the head of the American party which in Utah has given battle to the Mormon forces. He is a mining man, and owns a large amount of property in Salt Lake, in addition to several newspapers, and other public service enterprises. Senator Thomas Kearns has returned from Salt Lake and is now at his country home, the Kearns Ranch near Kenwood. Mrs. Kearns has been spending the past week in San Francisco awaiting the arrival of the Senator and they have both returned. The Senator is a busy man and will only remain here for a few days and then he and Mrs. Kearns will go east to stay until after the holidays. Former United States Senator and Mrs. Kearns arrived from Utah on Sunday at their beautiful country home, Kearns Ranch, near this city. Senator Kearns took an active part in the recent elections in Utah, and otherwise has been very busy with the handling of his immense interests. He enjoys a visit to his picturesque estate in the Sonoma Valley, where he is carrying out many improvements. Thomas Kearns is also here and is feeling much better. He recently underwent an operation for appendicitis.